I wish it could have been sooner. But now is better than never for people who have been suffering the biased reporting of this reporters reporter for way too many years. Rathers endless love affair with the tyrant-for-life of Cuba made him infamous among Cubans as he not only nauseated, ulcerated and may have caused high blood pressure, heart burn and heart attacks in Cuban Americans in the U.S. With the false image of Castro that Rather promoted, he caused a lot of pain and suffering for the Cubans surviving under Castros boots. How many more people died in the Florida Straits trying to flee Cuba due to Rathers biased reporting? How many more were incarcerated, tortured and endured forced labor? How many more were executed, were victim of political assassinations and denied of medical attention in jails during the 44-year tenure of Rather on CBS that began in 1962? Rathers inaccurate reports from Cuba helped to prolong Castros state terrorism upon the Cuban people. Among the people oppressed by Castro, Rather gained an honored place among the collaborators of that regime. I also did an expose of Rathers April 2000 interview with Juan Miguel Gonzalez that is included on the Special Edition DVD of my documentary The Rats Below. Cubans will not forget. I am sure that other ethnic groups in the U.S. with firsthand knowledge of their country and government also found inaccuracies, misinformation and propaganda in Rathers reports and those of other liberal reporters like him. But, as they know about their countries, I know about my birth country and my 38 years living in the U.S. being offended and dismayed by such examples of bad reporting. Its simply embarrassing. Are Rather and people like him the pillars of the U.S. media? No wonder in a Freudian slip he concocted his motto courage. Yes, you needed courage to stomach Dan Rather. Im not usually like this. Im not apologetic for my words. They are an accurate reflection of our feelings and intelligence of being hurt for 44 years of frustration and indignation caused by CBSs Rather. Our only relief is to know that he left CBS in some sort of discredited way. Dan Rather and CBS: slime liars of all media. Great post! Too many people are soft of the crimes of this master propagandist. He's finally arrived at the obscurity he so well deserves. History will remember him for his fa;se reporting, because we will keep the record and write the books. A Freeper in the know scooped the world on Rather's contract not being renewed, weeks before the official word came down. Anyone have a link? Who's the "Dan Rather" you're writing about? Was he somebody famous? Mr Rather is as much deserving of the love of America's and the billionaire, Fidel's, Cubans as by those of us who know that the sedition and subversion of the likes of him and Cronkite and Peter Arnett and their filthy lying ilk, with a little help from the treason of Kerry and Fonda and the political corruption of Jack Kennedy and Lyndon Baines Johnson and their war-profiteering "Democrat" gangster cohorts, caused the loss of American national and political will that cost the lives of the three and a half million South East Asians slaughtered after we, never having lost a battle there, so ignominiously fled Vietnam. 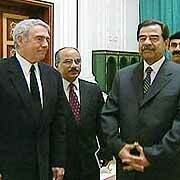 And don't forget, it was Rather who snagged an interview with Saddam Hussein in 2003. 44 years down the tubes. Glad to see Rather Bias get 'da buckwheats' in the end! What kid of weird retrograde business is it that employees work there for 44 years? Has to be the only one left in the country. If he'd just pulled out a gun and shot him then and there he would have gone out a freakin' hero. I'll let you guess which one would have been the shooter. One that measures a man by only the force of his own ego, which both he and it forever confuse with talent -- and pays him according to that measure. Politics, particularly "Democrat's" politics, operates on the same "principles." As, at every level, do gummint bureaucracies.